mediBall Pro Plus® retains its shape under heavy loads, maximising the body's stabilisation process. 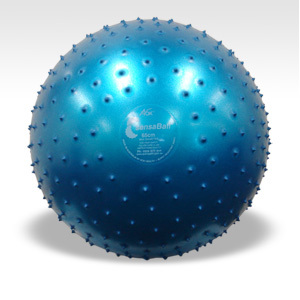 It is ideal for seating, exercise, rehabilitation and can be used with duraDisc, airRoller , medicineBalls , BallWeb and weights to gain a more challenging workout. Also improve your posture, reduce back pain and brighten up your office/classroom with our colourful mediBall Pro Plus® chairs. With a burst resistant rating of 500kg and independent testing conducted by the University of Newcastle, the AOK mediball Pro® is reputed to be the strongest and safest Swiss ball in the world - well no more! AOK's research and development department has surpassed the mediball Pro® technology to introduce the mediBall MAX®. The mediBall MAX® has a burst resistant rating of 750kg, a non-slip surface and is available in black or gold. Improve your circulation & ease back tension. The surface of the sensaBall™ is covered with sensory nodes that help increase proprioceptive feedback and improve circulation. A great alternative to back and body massage when rolling over the ball. The sensaBall™ can also be used as a conventional chair or for stretching routines. The smaller size makes a great foot stool for tired and aching feet.